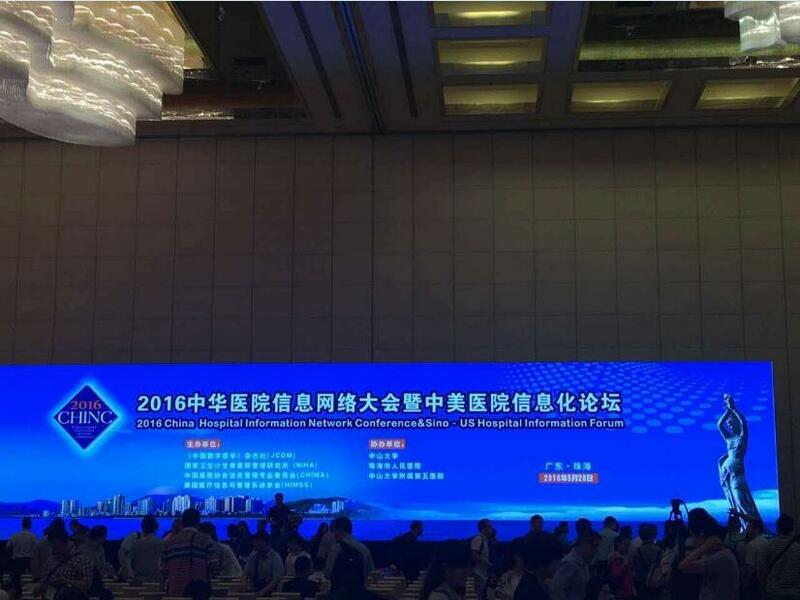 May 28th, 2016, the 2016 Annual China Hospital Information And Internet Conference and Sino-American Hospital Informatization Forum, initiated and planned by “China Digital Medicine”, jointly hosted by National Institute of Hospital Administration, China Hospital Association Information Administration Professional Committee, HIMSS, ATA, was grandly opened in Guangdong Province Zhuhai City International Convention & Exhibition Center. As the leading enterprise in the “internet + medical” industry, E-Techco Group (Qianhai AnyCheck) VP & CMO Mr King, Military Department Director Zou Jianghong, Senior Market Manager Li Jiayang and Mr Ai Wei attended the meeting upon invitation, and made important discussions in the summit forum. China Hospital Information Internet Conference is a professional giant conference in the domestic hospital informatization area, and it has been successfully held for more than 10 years, and has a great influence on the industry. This conference and summit forum lasted 3 days. In the conference, domestic and overseas medical and health administration departments, medical health institutions, medical colleges, research institutions, IT enterprises all gathered here to discuss internet + medical, medical data mining, precision medicine, hospital precision administration and other hot pot topics. E-Techco (Qianhai AnyCheck) market team made discussion with many major hospital medical informatization experts for E-Techco Group’s new technology applications and medical big data mining in the “internet + chronic diseases management”, “internet + family doctors”area, won the extensive favors of the experts, and agreed to strengthen exchanges and cooperation hereafter, jointly contribute to accelerate China’s medical informatization building, promote the “internet + ”new technologies applications, promote the medical health service, smart medical service and medical health big data application that benefit all the people, improve medical serve ability and administration level. E-Techco ( Qianhai AnyCheck ) is the domestic and overseas leading health management service practitioner, it is the first full license internet health service practitioner in the internet + medical area. In 2015, its operation revenue exceeded 900 million RMB. E-Techco group’s products have been extensively used in medical informatization, mobile health management area, which brings great convenience to the vast majority of health care providers, patients and relatives, leads the digital medical’s development in technology innovation and business patterns. The E-Techco has the self-developed AnyCheck health APP, the downloads has exceeded 32 million, registered customers reached 8.27 million. In addition, the Group attaches great importance to the innovation talents building, currently has a world class international talents team, which has 5 Academicians, 10 Professors, 28 PhDs, more than 10 overseas scientists and experts, they specialized in scientific research and innovation in Bio-IT, Bio-sensor, cancer screening, O2O medical service, big medical data, military and civilian integration areas. E-Techco has provided the strong platform support for the talents entrepreneurship and innovation, successively obtained the qualifications and honors such as “National Post-doctor Work Station”, “Guangdong Province Internet Medical Engineering Center”, “Guangdong Province Medical Big Data Research and Application Demonstration Center”. it is very productive in intellectual property area, as of May 28th, 2016, E-Techco has applied 1274 all kinds of intellectual property, including 996 applied patents, including 280 invention patents, 355 new utility model patents, 66 appearance patents, 295 international patents(in the form of PCT), 111 software copyrights, 29 domestic and overseas trademarks, 7 domestic and overseas domains, 40 domestic and overseas authentications, 13 third party technology advancement certifications, 78 published papers. 570 authorized intellectual property rights, including 318 intellectual property rights authorization, 98 software copyrights, 16 trademarks, 7 domains, 40 international certification, 13 third party technology advancement report, 78 published papers. In order to praise E-Techco Group’s contributions in technology innovations, Shenzhen Municipal Intellectual Property Bureau awarded E-Techco as the third place in its recently published 2014 annual Shenzhen intellectual property work advantage 20 list.